Where’s Halmoni? by Julie Kim (2017). This picture book meets graphic novel is fantastic in every way! 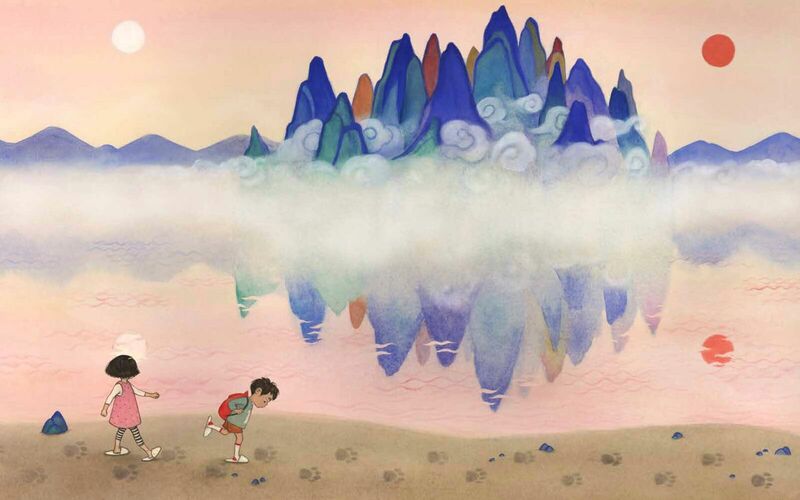 Infused with Korean folklore, gorgeous, action-packed illustrations, and a pair of siblings on a quest to find their grandmother, this is an absolutely delightful adventure. Halmoni means grandmother in Korean, and this story is two children’s quest for theirs who is missing from her home when they arrive there. They smell her red bean soup, but that, too, is nowhere to be found. 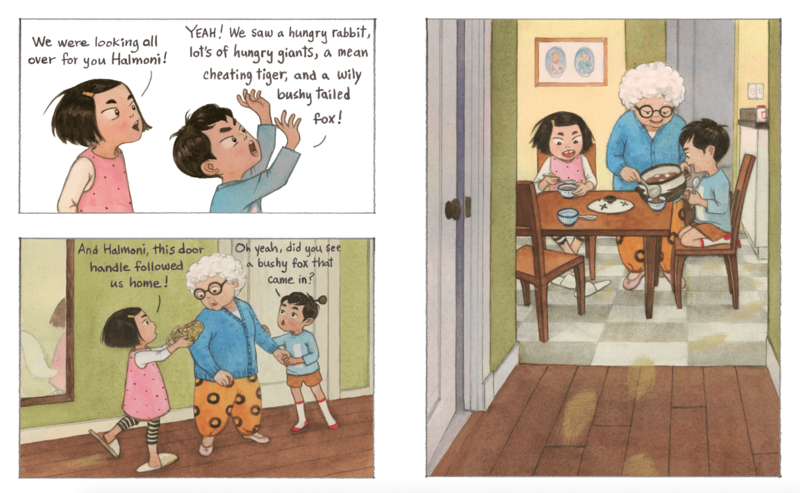 One of the most delightful things about this book is the little visual clues sprinkled in the illustrations of Halmoni’s house that foreshadow characters the two kids will meet on their journey: a fox, a tiger, and dokkebi (trickster goblins). The scenes with each character they meet are funny, playful, and mysterious all at the same time and the sibling dynamic is loads of fun too. The main characters must interpret all that comes along on their path and figure out how to solve each problem they face. My favorite part is when the kids play rock-paper-scissors with the tiger from the cover in order to get back Halmoni’s red bean soup pot. It’s an action sequence that plays out beautifully, complete with twists and turns and tricks. And there is a key at the back to explain what characters were saying when they were speaking Korean in the text, as well as a glossary of Korean folktale figures who appear in the book. Julie also shares in the back matter that when she was a child and something disappeared, her parents would say, “This must be the dokkebi playing tricks!” That mysterious, mischievous spirit infuses this terrific tale. Big thanks to Little Bigfoot for images! The author-illustrator herself, Julie Kim, is here to share a recipe for red bean soup with sweet rice balls! That’s the soup Halmoni makes and finally serves the children at the end of the book when their adventure is over. 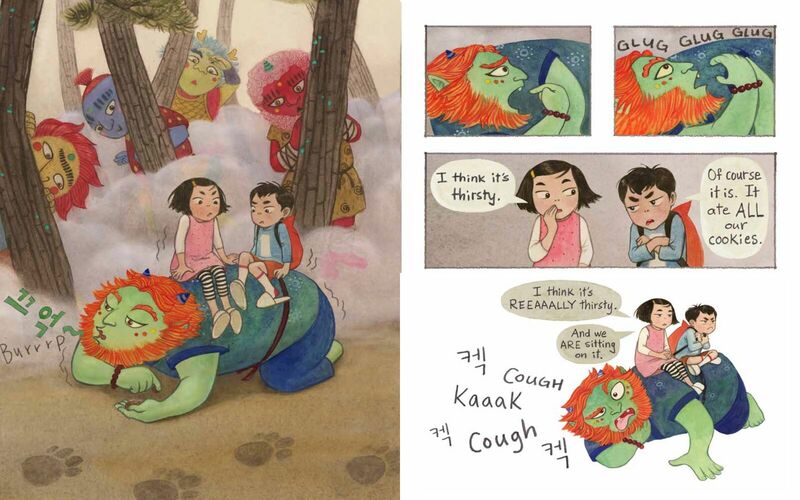 There is a popular Korean folktale where a tiger comes to eat up an old woman living alone in the mountains. It is summer, and the old woman tells the tiger to come back in the winter when it is more hungry. By then, her red beans would be ready for harvesting and the tiger can have red bean soup as well. The tiger thinks this is a great idea and tells the old woman it will be back in winter. Meanwhile, summer and autumn pass and the old woman weeps as she makes red bean soup. She knows she doesn’t have long to live. Luckily, little creatures like the turtle, a mat, a wooden carrier, and even a pile of poo come to her aid in exchange for the red bean soup. They all team up to foil the tiger and throw it over a cliff. We eat it at home too, but this story of the grandmother was mainly the inspiration [for including red bean soup]. Like a lot of things that I do, this recipe is a bit of a mishmash. Traditionally, there are two types of red bean soup (called Pot-Jook in Korean): the savory kind with rice, and the silky sweet kind with sweet rice balls, which you can add to either type. I like the texture of the savory type and my children like the taste of the sweet version, so I combined the recipe and topped it off with sweet rice balls. By doing this, I end up with a hybrid, a sweet red bean soup/porridge that has the texture of rice pudding. And you can go either way, savory or more sweet, depending on whether you add or omit the sugar. 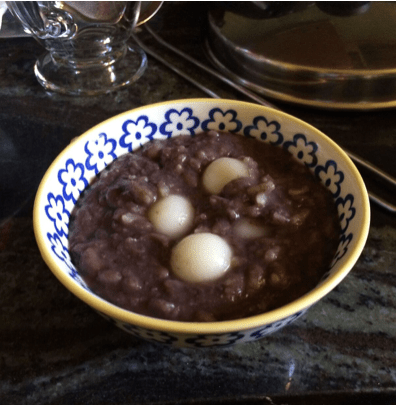 Here’s Julie’s red bean soup and sweet rice balls recipe along with step by step photos to download as a PDF! 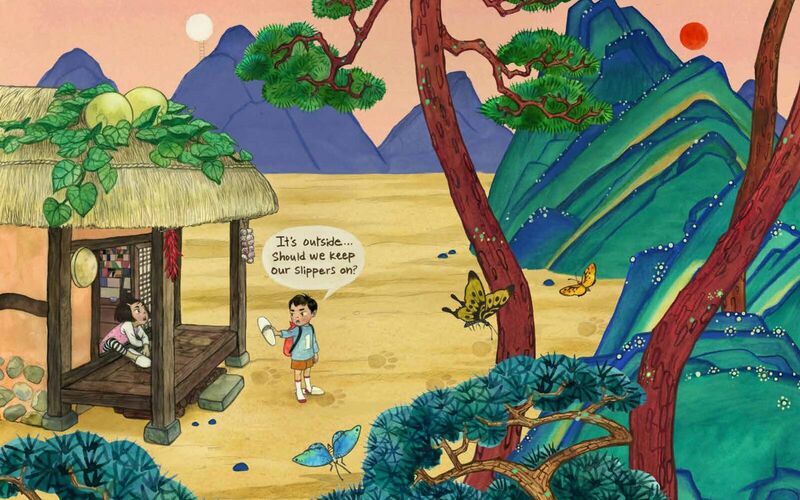 Julie Kim is an author and illustrator living in Seattle, WA. She has published with Cricket Magazine, Scholastic, and Mondo. Where’s Halmoni? is her authorial debut. Looks amazing! Can’t wait to read Where’s Halmoni?